Counter-clockwise from top, IAM Midwest Territory General Vice President Phil Gruber, Local Lodge 1363 Directing Business Representative Phil Zannella, Jr. and Onex Corp. Senior Managing Director Seth Mersky received the 2013 “Gift of Sight Award” at the 33rd Annual William W. Winpisinger Charity Banquet in Las Vegas. 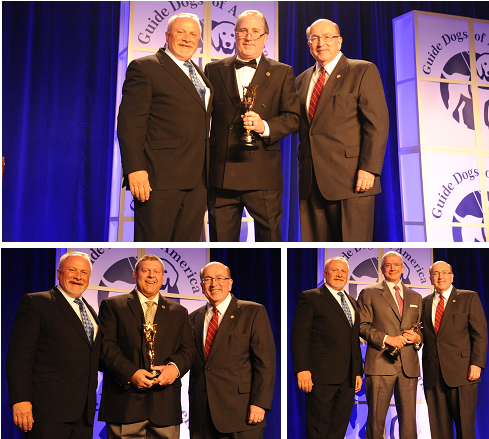 IAM Midwest Territory General Vice President Phil Gruber, Local 1363 Directing Business Representative Phil Zannella, Jr., and Onex Corp. Senior Managing Director Seth Mersky were honored with the 2013 “Gift of Sight Award” from Guide Dogs of America (GDA). The awards, given annually in recognition of extraordinary efforts on behalf of GDA, were presented at the 33rd Annual William W. Winpisinger Charity Banquet in Las Vegas. GVP Gruber began raising money for Guide Dogs early in his IAM career. As president of Local Lodge 688 in St. Louis, Gruber organized a dinner that raised $10,000 for the organization, enough at the time to fund the training of one guide dog. Cleveland Local Lodge 1363 DBR Zannella recalled hearing former IAM International President William W. Winpisinger say he’d be honored to someday have his name attached to GDA, then International Guiding Eyes. Zannella said it was his father and “Wimpy” who inspired his passion for GDA. Buffenbarger praised Onex Corp. Senior Managing Director Mersky for preserving thousands of good-paying IAM jobs in Wichita, KS, when the company bought a division of Boeing commercial airplanes to create Spirit AeroSystems. The weekend’s festivities also included the annual Hawgs for Dogs motorcycle ride, a charity golf tournament and a sporting clay event. Those events and the banquet combined to raise 20 to 25 percent of GDA’s annual budget.